The Nez Perce settled on the Columbia Plateau between the Cascade Mountains and the Rocky Mountains. The top of the plateau was mostly flat and covered with thick prairie grasses, which the Nez Perce used to build their homes. Many rivers are found in the valleys of the region. The area around the rivers is a thick forest. The Nez Perce used the rivers and forests for shelter, food, and clothing. The difference in altitude between the river valleys and the top of the plateau meant a difference in temperature/climate. The temperature on top of the plateau was cooler than in the valley, which meant that the same plants and berries would bloom at different times. The main type of housing for the Nez Perce was the mat covered longhouse. These houses were made from logs linked together, then covered with mats woven out of the prairie grass. Many families lived together in one house. Each house could be up to 100 feet long. Nez Perce wove baskets and mats out of prairie grass. The Nez Perce carved canoes out of logs. They would use the canoes to travel the many rivers in the region. 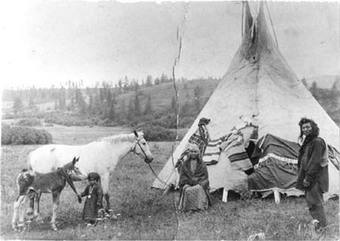 In the 1700s, the Nez Perce acquired horses. They raised horses on the prairies of the plateau, and had one of the largest herds in North America. The Nez Perce believe that all things in nature, such as rocks, animals, rivers, plants, etc. had at one time had the characteristics of people. They believed that they could still communicate with the human side of nature. When children reached a certain age, they would go into the forest for a visionquest and seek supernatural guidance from things in nature. This guidance would determine their future success within the tribe.